Elaborate restaurant architecture was Rank's trademark feature. Film producers The Rank Organisation went on to set up cinemas, and then branched out to build some of the early motorway services under the name Top Rank (later Rank Motorway Services Ltd). Rank's first bid was a successful one for Medway, in partnership with PDS Garages of Worcester. 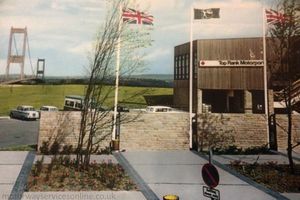 In 1964 Rank put together a team of staff dedicated to bidding for new motorway services. They were the first operator to introduce showers, claiming that the image of lorry drivers was changing. Much like the film industry, Rank's motorway services were about being big and bold. While none of those ideas have really stood the test of time, they've certainly formed a big part of the motorway industry's history. In 1967 they dropped the phrase "service area", and insisted on using the grand title 'Motorports'. Rank's obsession with being futuristic gave rise to elaborate architecture and facilities which offered almost no human contact at all. All of the services they built cost more than twice the investment suggested by the government - Medway was almost four times, leading to the government suspecting they simply wanted to buy their way into the industry. While initially painted dark and sober colours, Rank soon changed this for a blue-and-yellow colour scheme. In the 1980s, this changed to green, yellow and mustard, with restaurants filled with potted plants. They introduced an own-brand restaurant called Highway In, which was criticised for being "drab". Many of their services had takeaway units branded 'Wimpy Express'. They also trialled a Lyons ice cream van. 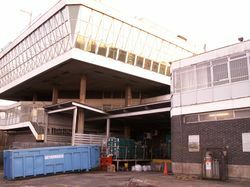 Although well-maintained and usually tidy, their services were known for being expensive. Ultimately, their finances never caught up with their initial investments. After an initial couple of years of building bold and distinctive services, Top Rank quickly learned that such buildings were expensive to maintain and difficult to make a profit out of. As such, the rate of their construction slowed down significantly, and they settled for a more conservative brown colour scheme. The following 20 years used almost no enterprise at all, but exercised extreme caution. By 1969 Top Rank were pleading with the Ministry of Transport to have their rent arrangements negotiated, arguing that inaccurate traffic forecasts had made their business difficult. They wanted to introduce a news theatre, conference room and grocery shop to their services to attract more custom. When this wasn't honoured they refused to bid for any more services, but concerned about their competitors gaining ground, in 1976 they quietly began to bid again. In 1982 Rank complained they were still running a loss. In 1986, the parent company made an ambitious bid for Granada's parent company, which could have seen its services, hotels, entertainment and television facilities transferred. In 1991, following the takeover of Mecca, Rank encountered a mountain of debt which they blamed on the economy. They decided to sell off some of their subsidiary companies, the first of which was the motorway services. These were sold to Michael Guthrie, former CEO of Mecca, resulting in the services being branded as Pavilion. Rank had also sold him Pizzaland and Prima Pasta. Two new services were included in the deal, which Rank said had not reached their full potential. The Rank Group continues to operate casinos today. The Rank Organisation's iconic gongman logo was used throughout their motorway services. Originally, their sites were branded 'Top Rank Motorport', in black-on-white and styled like a wheel. Their logo changed from black to a very dark green. In the 1980s, their parent company's green colour scheme became more prominent. Initially, their road signs used green-on-white, but this was later reversed to white-on-green. The Top Rank gongman logo, used alongside all their products. The same symbol being used on a sign in the 1980s.